The following summary is based on a poster presented at The American Institute for Cancer Research November 5-6, 2008 which examined the impact of estrogen metabolism modifiable gene testing and the impact of the mitigation efforts to their breast cancer risk. In 2008 when this work was presented at the AICR, 125 women were being follewed. As of June 2013, over 175 women are being tested and enrolled in risk mitigation. Results so far have been that none of the identified high risk women have developed breast cancer and those women with estrogen positive breast cancer had not had a recurrence. In 2008, of the women with breast cancer, 81% had SNPs on CYP1B1 and COMT and GSTM1 was absent in 82%. 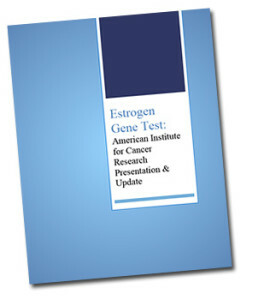 All 75 women with estrogen positive breast cancer had had significant exposure to exogenous estrogens through either hormone replacement therapy (HRT) and/or in vitro fertilization (IVF). In addition to their traditional cancer treatment, supplements were used to alter their genetic pathways including DHEA, DIM-PRO, SAM-E, Glutathione & Anti-oxidants such as NAC, Milk Thistle and Vitamins E & C.
Since the presentation of this work in 2008, new research has been published which correlates with our experience. A study published in the Journal for Gynecological Oncology, June 2012, found that when there were 3 or more gene mutations, risk increased by 2.5 to 13 times depending on the genes involved.